I respect former Knesset speaker Avraham Burg. Over the years, Burg has managed to extend the scope of the Zionist self-criticism; he has challenged the Zionist discourse, Israeli society and even Jewish identity politics. A few days ago, in a New York Times opinion piece, he attempted to explore the reasons behind the collapse of Israeli democracy. Burg was obviously referring to Mitt Romeny’s grave comment in Jerusalem last week. But, in his analysis of the relationship between the two warmongering states, Burg may have failed because, in reality, nothing much has changed in recent years. On the contrary, the true nature and deep cultural, ideological and spiritual bond between America and Israel is now clear for all to see. This observation by Burg is puzzling. How could an intelligent person, Israeli or not, even consider the Jewish state to be ‘humane’? But I understand Burgs delusion, after all, it took me many years to admit to myself that the Israeli existence was unethical to the bone. Burg reckons that Netanyahu has forced American Jews “to make political decisions based on calculations that go against what they perceive to be American interests.” Is he correct about this? I am not so sure. I would argue that the American Jewish Lobby pushes for policies that serve what it believes to be ‘good for the Jews’. AIPAC is not interested in ‘American values’ and has certainly never been concerned with humanism either. The Lobby is concerned solely with Jewish interests and, as such, is pretty successful in enslaving America to its power. Here, I don’t entirely agree with Burg. Although the political impact of Jewish orthodox parties is rapidly growing in Israel, Israeli politics is still dominated by non-orthodox parties. Israel’s problems have more to do with its interpretation of Jewish secularism. It is the, relatively new, godless Jewish identity that made God into an estate agent. It is secular Jewish politics that made the Israeli Jew into a plunderer of someone else’s land. And it is Barak and Netanyahu, rather than the rabbis, who are pushing day and night for a suicidal global war against Iran. Burg is slightly wrong here. The Zionist forefathers promised to make the Jews ‘people like other people’ which means that they, in the first place, accepted that Jews weren’t like other people. Already in the early days of ‘secular’ Zionism, Jewish ethnicity stood as the collective bond. But this cement wasn’t geo-centric, it was actually racist. Jabotinsky and Nordau used biological determinist terminology: referring to race, blood and genes. Burg cannot deny that the 1948 expulsion of the Palestinians was driven by Jewish racist ideology. But, to some extent, Burg is also correct. I guess that his generation and mine as well could be seen as a fulfillment of the Zionist dream. We regarded ourselves as Israelis, we weren’t even Zionists. For us, Jewishness was a secondary matter. Some of us were religious, others weren’t, but we were all Israelis just because we were born in Israel. But then, as it seems, Israeliness wasn’t sufficient to sustain an Israeli collectivism. Something was clearly missing, and this is where the problem starts. Israel has never matured into a ‘state of its citizens’, it remained the ‘state of the Jews’. Burg claims that through “the elevation of religious solidarity over and above democratic authority, Israel has become more fundamentalist and less modern, more separatist and less open to the outside world.” Burg may be right here, yet it is no coincidence that the Jewish State recruited Judaism. Israel is no ordinary civil society. It defines itself as the Jewish state, it kills in the name of the Jews, it loves itself in the name of the Jews, it even loves itself killing in the name of the Jews. This, in itself, makes Jewishness into a primary ingredient within Israeli self-realisation and politics. Burg believes that the Zionist founders thought that ‘democracy’ was the only way to regulate and accommodate many contradictory interests. 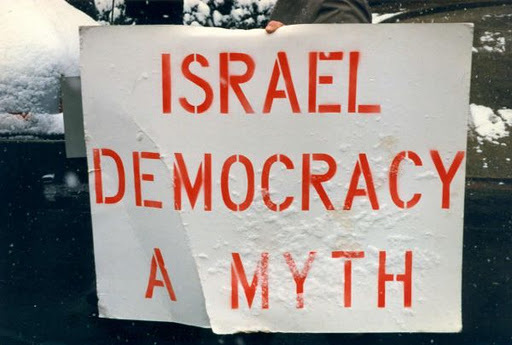 This may be correct but it was doomed to fail, for democracy and Judaism may contradict each other. Democracy is based on the vision of equal civil rights together with enlightened individualism, yet Judaism is fuelled by tribalism, choseness and the elimination of civil life in favour Hlachah law. It could be argued that the early Zionists, who were largely anti-Jewish, did indeed try to form a Jewish state that would be free of most Jewish characteristics. But their dream did not prevail, Israel is Jewish; it is tribal, it is racist: it is the definitive Jewish ghetto. Israel and Zionism have nothing to do with enlightened humanism - probably for the same reason that Jews had no impact on the evolution of enlightenment. So I guess that Burg is deluded when he argues that “the modern combination between democracy and Judaism was supposed to give birth to a spectacular, pluralistic kaleidoscope.” Israel is pretty much the opposite. It is a kaleidoscope of every alarming Jewish political symptom. It is oppressive, abusive and supremacist. And it is not necessarily orthodoxy, as Burg suggests, it is actually Jewish secularism that brings all these extremely problematic symptoms to light.